[-3]: Destroy target artifact, creature, or enchantment. Create a colorless treasure artifact token with "T, Sacrfice this artifact. Add one mana of any color to your mana pool." Pikobyte , I'm sorry, i completely forgot to answer to you, here my version of your Muldrotha Muldrotha, the „Fun“ in the VERY CHEAP „Funeral“, it is almost the same of your cheaper version, but I tried to save more money (I'm a student and I don't work, so not much money to spend in magic), plus a few changes to shape the deck to my game style; I took off Vraska the Unseen for Vraska, Relic Seeker because you're complete right about it, but i left the other two cards ( Underrealm Lich and Elixir of Immortality ) because they make me feel safer. One thing you could do, if you don't want to flesh out a full 4-5 color manabase, is you could play Ramos, Dragon Engine as your commander. You can build the deck Grixis, and just splash for Smothering Tithe and Vraska, Relic Seeker . The nice thing about Treasure and Gold being your theme is you don't need to play any rocks or lands in white or green to splash. Ramos is even an artifact, in case you want to run an artifact theme with stuff like Contraband Kingpin , Daretti, Scrap Savant , Gonti's Aether Heart , etc. Unfortunately, the best card that makes treasures is white, Smothering Tithe . This card alone in my opinion makes treasures a viable strategy in Commander. 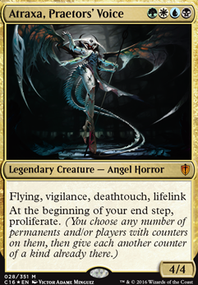 Combine Tithe with Revel in Riches , both enchantments which white has more tutors to find them, cards to protect them and cards to reanimate or recur them. 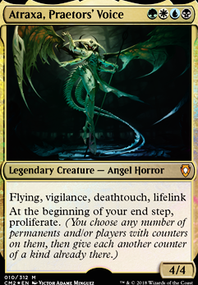 Teysa Karlov is a Commander to consider, she has synergy with Revel and Pitiless Plunderer giving you additional treasures when creatures die. White also has access to many board wipes which speeds up treasure production with Revel and Plunderer. Anointed Procession is a Doubling Season effect in white. 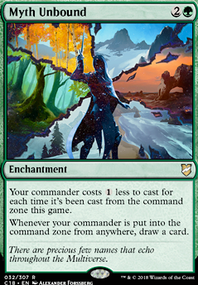 Another option is Esper with Zur the Enchanter as Commander. Zur can tutor for Tithe, Revel, Procession. Teysa and Plunder can be included in Zur. 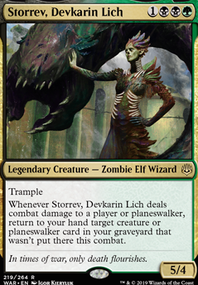 The last option to consider is Abzan with Ghave, Guru of Spores . 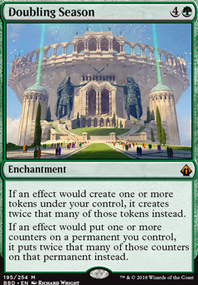 Abzan gives you access to Tithe, Revel, Teysa and Doubling Season effects. Ghave is a sac outlet which has good interaction with Teysa, Revel and Plunder. Vraska, Relic Seeker is another good card that can make treasures that can be played in Abzan. I like this deck! +1 from me. Vicious Shadows seems interesting, but can whiff if that player lacks cards in hand. Sarkhan Vol or Vraska, Relic Seeker are 2 cards that will help your deck. Jarad's Orders is another suggested cut, because the deck doesn't care about filling the graveyard. Consider Phyrexian Arena or Golgari Findbroker . In my Prossh deck, I have Gatecreeper Vine because I needed something for 2 mana. 1 month ago, with the firsts spoilers, I have a similar idea (TRY JUND!) and I have a few suggestions: Frenzied Arynx is very slow, and you may cut it to add some Legion Warboss , Rekindling Phoenix ; I think that you may cut 1 Pestilent Spirit because you only have 6 instants-sorcey spells to use his ability, and 1 Rhythm of the Wild to add 2 copies of some planeswalkers like Vraska, Relic Seeker , Vraska, Golgari Queen or Domri, Chaos Bringer . Apart from this, the idea of add 4 copies of Spawn of Mayhem is good and funny, but the ability of lose life can be dangerous to you aganist aggro or burn decks (which I think is a playable archetype). One question: You nt have any sideboard?? 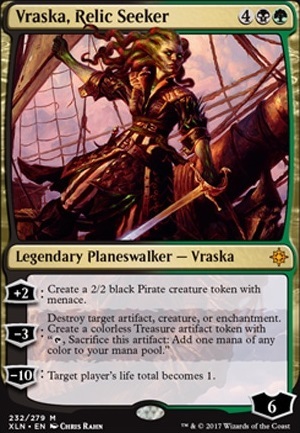 I not add the Vraska's Contempt because I have them in the sideboard. Vraska, Relic Seeker is great, and I could add them to the maindeck and put the Vivien Reid in the sideboard.